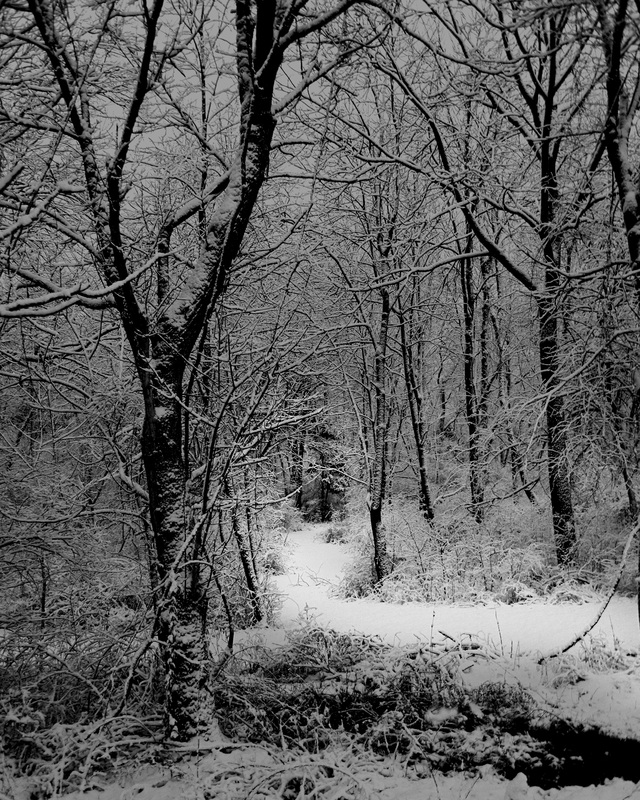 My all time favorite poem is Stopping by Woods on a Snowy Evening by Robert Frost. As part of a writing exercise for the Creative Writers Workshop, I turned the poem into a short story. Here are both for your reading pleasure. Up ahead the narrow dirt lane disappeared in the rapidly falling snow. I pulled lightly on the reigns, bringing my dappled colored horse and small sleigh to a gradual halt. Tall trees were gathered close around us, leafless silent watchmen wearing new coats of white, on guard as twilight slowly approached. I get my bearings as best I can, and I think I know whose woods these are. The man lived in the village just passed. Did he spend time here in nature’s sublime embrace or were these woods no more than some blotters ink on a sterile accountant’s page? No matter, for I am sure he will not see me stopping here to watch while the snow–as if on some great journeys end–rushes to cover all in virgin pureness, filling his woods with mounting drifts. I lift my head skyward and allow several fragile flakes to alight upon my face, darting around the once protective rim of my hat. They land and melt quickly, their coolness like a mother’s soft kiss remembered. My little horse must think it queer after the distance we have traveled to stop without a farmhouse hear. No guiding light shining a beacon’s promise of warmth or hay to eat. With only the woods and a frozen lake to be seen on the darkest night of the year, he must surely wonder if it would not be more fit for him to sit in the sleigh and for me to take up halter and harness to complete our journey. But I am mesmerized as I watch the countryside viewed through a curtain of heavenly origin while the coming night reaches out its hand to paint the scene in deepening shadows. The spaces between oaken trunks become magical realms that call to me, tempting me to pass between them like a gate to a world that mortal men only dream about. Something primordial beckons me, capturing my imagination as I drink in the timeless scene. I pull my great coat tighter as a chill winter wind gathers and caresses me, taking my breath away. With a shake of his harness bells my equine friend breaks my reverie. And as their tinkling dies away, the only sound that can be heard is the sweep of easy wind and downy flake. He seems to be asking if there were some mistake, some miscommunication between master and beast. With a smile of genuine affection and some kind words I let him know there had not been. It seems the same flight of fancy that had overcome me had not had the same effect on him. With a touch of the reigns I send us yet again down the now unbroken path of winter white. I glance once more between the bows of the ancient trees that still call out to me. The woods are lovely, dark and deep. But I have promises to keep and miles to go before I sleep. Love how you’ve captured both the essence and the tone of Frost’s poem in your story! Thanks Tricia. I wrote this story nearly 12 years ago. By far my favorite poem. Thank you. I can only imagine what it was like for Frost to experience it. Love it!!!! Can I use it in my 11th grade honors English class? By all means. Please let me know how it goes in your class. Think Ms. Williams would be proud? I can still remember you, Amy, Ricky and I in her junior year class. I not only hear his poem but I live in it. Many years has gone by since first I read Robert Frosts poem, but I remember I memorized it in three readings. I have loved it ever since my introduction to it in 1962. The poem lives in my soul and will be apart of me forever. Same for me, Steve. Thanks for giving my tribute a read.